"What the hell is that? Has anyone ever figured that one out?" Trump said in July. President Donald Trump and first lady Melania Trump praised former President George H.W. Bush after his death for being inspired by the American people. Bush called his philosophy "a thousand points of light" and his nonprofit dedicated to encouraging volunteerism was named Points of Light. "Through his essential authenticity, disarming wit, and unwavering commitment to faith, family, and country, President Bush inspired generations of his fellow Americans to public service -- to be, in his words, 'a thousand points of light' illuminating the greatness, hope, and opportunity of America to the world," the Trumps said in a statement issued after Bush's death was announced late Friday. The president echoed the sentiment Saturday saying, "His accomplishments were great." But Trump was not always so gracious about Bush's hope for a "kinder, gentler" nation. During a July 5 political rally in Montana, Trump attacked Bush, saying, "Thousand points of light, I never quite got that one." "What the hell is that?" Trump said. "Has anyone ever figured that one out? And it was put out by a Republican, wasn't it? I know one thing, Make America Great Again we understand. Putting America first we understand." The remarks were met with disdain by those who were close to Bush. Ari Fleischer, who was son George W. Bush's White House press secretary, tweeted at the time, "This is so uncalled for. Going after a 94-year-old, former President's promotion of volunteerism. I don't mind potus being a fighter. I do mind him being rude." 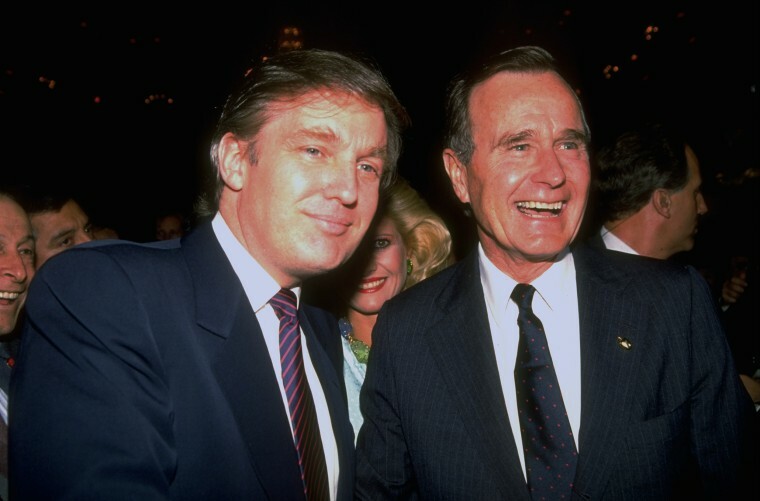 There was no love lost between Trump and George H.W. Bush. As a presidential candidate in 2016, Trump campaigned against his son, former Florida Gov. Jeb Bush, and mocked him incessantly, calling him "Low Energy" Jeb Bush. About one year ago, the publication of historian Mark Updegrove's book, "The Last Republicans," featured quotes from George H.W. Bush. "I don't like him," Bush is quoted as saying. "I don't know much about him, but I know he's a blowhard. And I'm not too excited about him being a leader." In April, when Bush's wife and former first lady Barbara Bush died, Trump did not attend her funeral service, and the White House sent Melania Trump. Former presidents Barack Obama and Bill Clinton were in attendance. On Saturday, the Trumps appeared to put the bad blood behind them. "Along with his full life of service to country, we will remember President Bush for his devotion to family --especially the love of his life, Barbara," they said in their statement. "His example lives on, and will continue to stir future Americans to pursue a greater cause."